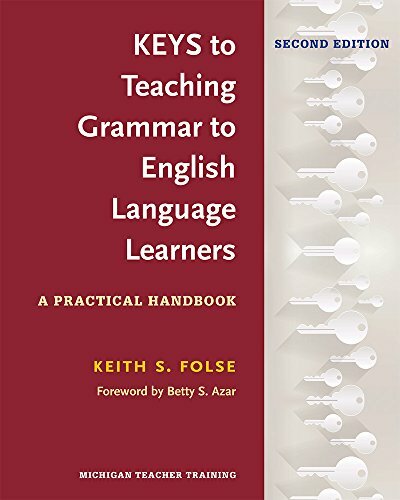 Keys to Teaching Grammar to English Language Learners: A Practical Handbook is not intended to be an exhaustive reference book about ESL grammar. Written for classroom teachers (K-12, ESL, EFL), this book teaches the most common ESL grammar points in an accessible way through real ESL errors together with suggested teaching techniques. Relevant grammar terminology is explained. The four objectives of this book are to help teachers: (1) identify common ESL grammar points and understand the details associated with each one; (2) improve their ability to answer any grammar question on the spot (when on the “hot seat”); (3) anticipate common ESL errors by grammar point, by first language, and/or by proficiency level; and (4) develop more effective grammar/language learning lessons. These objectives are for all teachers, whether they are teaching grammar directly or indirectly in a variety of classes – including a grammar class, a writing class, a speaking class, an ESP class, or a K-12 class. In the Second Edition, all chapters have been updated and substantively revised. The number of marginal (gray) boxes with tips and extra information has doubled. A 16th Key, on Negating, and three new appendixes have been added. One of the new appendixes provides a sample exercise from an actual ESL textbook plus relevant notes about the designing of grammar activities and suggestions for teaching each grammar point. Also added to each Key is a section on the vocabulary items (e.g., collocations) that are related to the teaching of that particular grammar point. This information is unique to this edition and cannot be found elsewhere on the market. The Workbook for the Second Edition (978-0-472-03679-0), available in 2017, includes numerous activities that practice the essentials of grammar and issues relevant to ESL teachers. If you have any questions about this product by University of Michigan Press ELT, contact us by completing and submitting the form below. If you are looking for a specif part number, please include it with your message.